"It is not for a believer, man or woman, when Allah and His Messenger have decreed a matter that they should have any option in their decision. And whoever disobeys Allah and His Messenger, he has indeed strayed into a plain error." According to the above verse, no Muslim individual, nation, institution, court, parliament or state is entitled to use its own freedom of opinion in a matter in which Allah (swt) and His Prophet (saw) have already decreed. Being a Muslim means to surrender one's freedom of opinion and action before Allah (swt) and His Messenger (saw) and hence, to act contrary to this would mean complete violation of Allah's (swt) laws. No sensible person would contemplate combining the two contradictory attitudes together since it is not only a matter of following strict laws, but is a matter of believing that Allah (swt) knows His creation better than the creation know themselves for He is the creator and thus, has set guidelines for the benefit of mankind. To consider ones own opinion to be greater than that of Allah's (swt) boils down to pure arrogance and is tantamount to associating partners with Him. Nevertheless, the fact of the matter is, if one wishes to remain a Muslim, one must inevitably have to submit to the Command of Allah (swt) and His Prophet (saw), and if one is not inclined to submit, then one will have to accept that one is not a Muslim. If the individual does not accept the fact that by violating Allah's (swt) law one no longer remains Muslim, then such an individual will be regarded as a hypocrite both by God and by the people even though they proclaim to be Muslim at the top of their voice. When it comes to the manner in which the believer conducts his life, guidance is dependent on an unequivocal adherence to the Holy Qur'aan and Sunnah, since these are the divine sources by which every aspect of one's life need to be conducted. It is but the role of scholars to ensure that they guide adherents so that their edicts on issues of Fiqh are ruled on pursuant to these divine sources. Let us now cite an unequivocal statement of the Hanafi positon in regards to this. Principle: Every verse that opposes the statement (ruling) of our scholars, it will be said this verse of the Holy Qur'aan has been abrogated. Principle: And if we receive a Hadeeth of the Prophet (saw) that opposes the statement (ruling) of our scholars, it will be dealt with as abrogated. 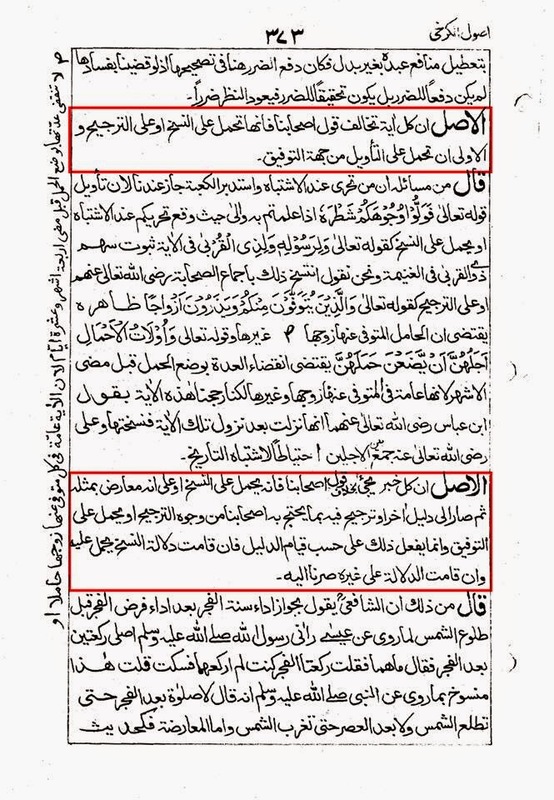 Source: Usool Al-Karkhi. Pg. # 373. According to this edict, the so-called 'Ahl ul Sunnah' are perfectly comfortable with disregarding the Holy Qur'aan and Sunnah on any matter wherein their scholars have made a ruling that contradicts these primary sources. The slogan that any ruling given from their scholars which contradicts the Holy Qur'aan and Prophetic Hadeeth should be disregraded is nothing short of a myth. Any rational person would assume that the correct position would be to disregard the ruling of the scholar on the premise that it is in conflict with the Holy Qur'aan and Sunnah, the sources on which the Shi'a are based upon. However, this is not the case for the adherents of the Hanafi Fiqh, for them the Holy Qur'aan and Sunnah can take a back seat, nay, they can be tossed aside as otiose, since a man from their School has made a ruling that contradicts them. This is a shocking admission that is in fact an open mockery of the authority of Allah (swt), since it is an acknowledgment that to Hanafis, the Holy Qur'aan and Sunnah have no value if their scholar has opined something which differs from these sources. What he has opined truly trumps the Word of Allah (swt) and the Sunnah of Rasulullah (saw). 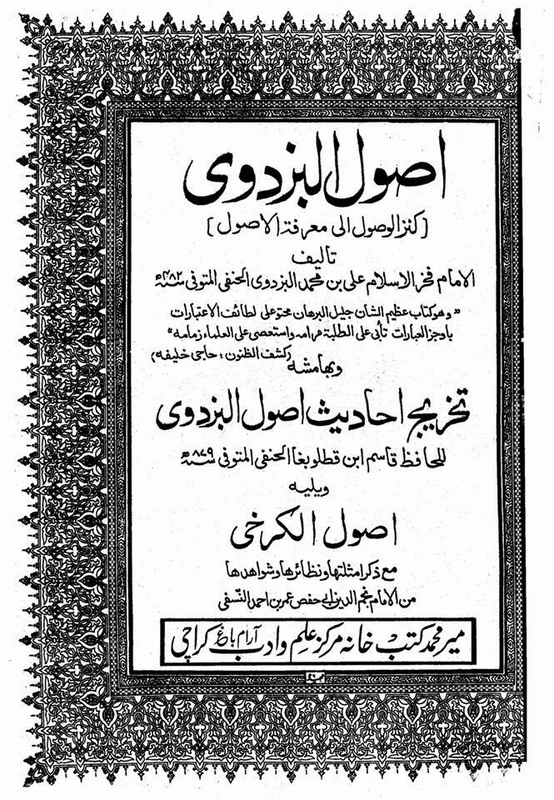 It is incredible that rather than allow jurisprudence to be shaped by the Holy Qur'aan and Sunnah, Hanafis believe in whatever resolves around the rulings of their jurists, to the extent that rather than distance themselves from a ruling that comes into conflict with the Holy Qur'aan and Sunnah, they are encouraged to be embraced and are compelled to deem any divine ordinance from the Holy Qur'aan and Sunnah that conflicts with it to be completely redundant. The biggest irony is that the so-called 'Ahl ul Sunnah' are particularly fond at twisting Shi'a narrations suggesting that the Imams of the Ahlulbayt (a.s) have the authority to override the Holy Qur'aan and Sunnah. We would invite the so-called 'Ahl ul Sunnah' in particular those with Hanafi leanings, to canter carefully at this fatwa and thereafter throw their head down in shame ad infinitum, for they are the adherents of a detestable cult that has no true regard for the Holy Qur'aan and Sunnah. That's a shocking principle from this sunni scholar. Who is this person? What position does he hold amongst the hanafis ? I wonder why the entire Arabic quotation has not been translated? How the hell can a person converse with a rafidhi when his principle is to dissemate half truths, conceal the truth and even resort to outright lies. By Allah, the Noble Ahlul Bayt have as much association with the the Rawafidh as Islam has with Idol worship i.e absolutely no association. You Nasibis are the ones who think truth and falsehood is the same. You mix truth with falsehood. You deem it equal.